History API is arguably the most pressing issue on EOS Main Net for a few months now. dApps, block explorers, and wallets must consult historical information to work properly, and running a full history on EOS Main Net became expensive, complex and time-consuming. V1 History API was deprecated and only a handful of BPs kept providing full public History nodes for the entire network, (kudos to Sw/eden, CryptoLions, EOS Tribe, Greymass, EOS Canada, EOS Asia and Oracle Chain!) while many others are putting considerable efforts on different solutions to solve this problem. Some argue that this is not a big issue because dApps can find a business model to pay for partial history nodes focused on their transactions, while block explorers and wallets could use light history. However, the prevalent perception among the community is that difficulties in providing historical chain data can hinder EOS capacity to meet scalability expectations, and this kind of prophecy is usually self-fulfilling. EOS Blockchain contains approximately 46 million blocks at the time of writing (3/7/2019), so for a newcomer to start providing the service, nodes must ingest all those blocks and the 2 more blocks that are appended every second to the blockchain in a process that currently takes weeks. Once synced, the current v1 History Plugin takes more than 5 Tb of storage to run. Querying this database demands lots of processing power and network bandwidth. As a result, running a full history can cost more than USD 15k/month. A few months ago EOS Rio team started brainstorming on possible solutions for this issue. Instead of focusing on perceived bottlenecks to increase data ingestion, storage, and querying capabilities, we decided to start from scratch. The first step was to analyze what could be done to optimize database size itself. We learned that History API v1 stores a lot of redundant information. The original history_plugin bundled with eosio, that provided the v1 API, stored inline action traces nested inside the root actions. This led to an excessive amount of data being stored and transferred whenever a user requested the action history for a given account. 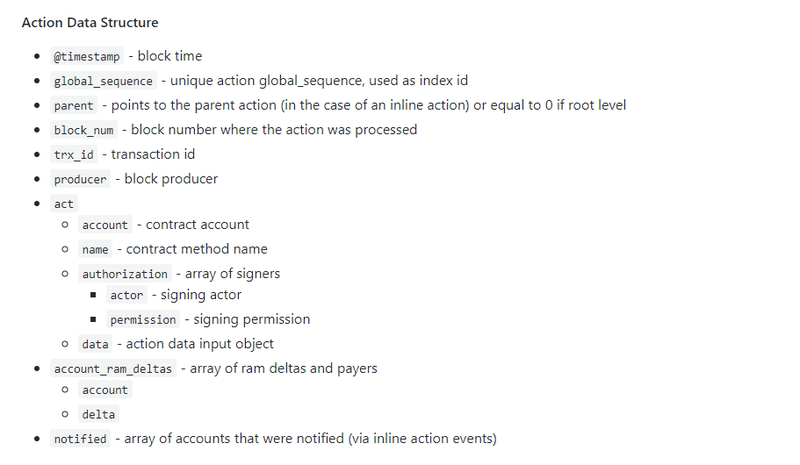 Also, inline actions are often used as an “event” mechanism to notify parties on a transaction, and there is little value in storing it. Changing format and cutting data redundancies reduces database size in about 85%, from almost 5 Tb to approximately 650 Gb. To further improve performance we engineered a multi-threaded indexer that extracts data from the state history plugin and makes it possible to ingest the complete EOS blockchain in approximately 72 hours with proper hardware optimization, while the current solutions can take weeks. We also introduced an “ABI History Caching Layer” component to prevent deserialization failures when parallel processing historical data over ABI modifications. For the database, we deployed an Elasticsearch cluster running on two custom assembled bare metal servers collocated on tier 1 infrastructure in Rio de Janeiro/Brazil. The optimized data structure tends to reduce CPU and bandwidth consumption making infrastructure more scalable. Other BPs running full history APIs are already testing Hyperion and helping on its evolution. For developers, delivering a flattened out result is better than today's History API standard. The current eosio history plugin unnecessarily inflates the database with redundant information (for end-user history purposes). The possibility to filter inline actions allowed a reduction on API bandwidth consumption and coding complexity. To accommodate those changes EOS Rio and other BPs developing history solutions are advocating for a History API V2 standard, to be adopted by the EOS community. Please take the time to evaluate it and send us feedback. EOS Rio is already providing History API using Hyperion at https://eos.hyperion.eosrio.io/v2/docs/index.html. The project code and preliminary set up instructions are available at https://github.com/eosrio/Hyperion-History-API, we are releasing this under an open source license for non-commercial use. 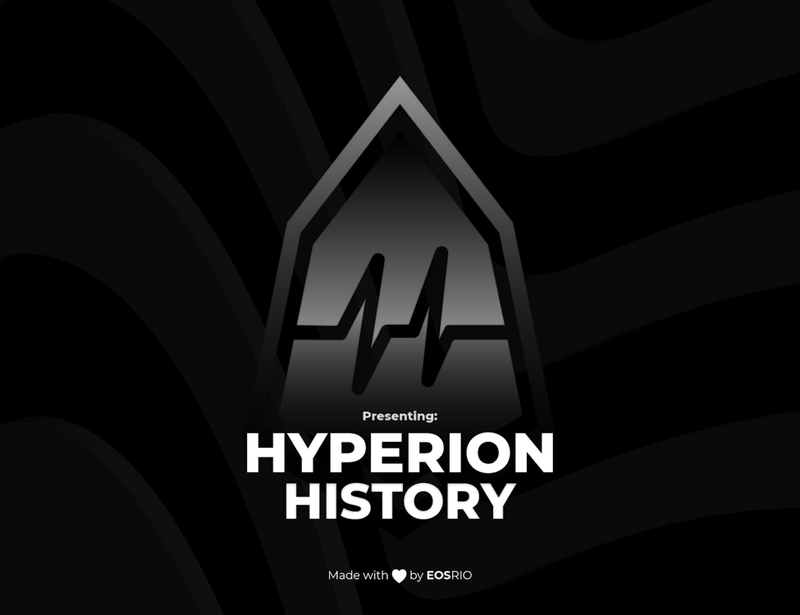 We are available to assist anyone who wants to run Hyperion History and we are keen on feedback. The immediate next step is to implement a WebSocket API for action streaming. That's what we're working now. When we finish it, the next feature is Hyperion Analytics, an advanced layer on Hyperion History API to offer detailed EOS statistics. 히스토리 API는 지난 몇 달간 EOS 메인넷의 가장 시급한 문제였습니다. dApp들, 블록 익스플로러들, 그리고 지갑들은 제대로 작동하기 위해서는 히스토리 정보를 끌어와야 하는데, 풀히스토리 노드를 메인넷에 구축하는 것은 아주 비싸고, 복잡하고 시간이 많이 들게 되었습니다. 첫번째 버전의 히스토리 API는 널리 쓰이지 못했고 오직 몇몇 BP들만 전체 네트워크를 위해 풀 히스토리 노드를 제공했습니다 (Sw/eden, CryptoLions, EOS Tribe, Greymass, EOS Canada, EOS Asia 그리고 Oracle Chain 에게 박수를 보냅니다). 그 동안 다른 BP들은 다른 해결책을 위해 열심히 고민했습니다. 몇몇은 dApp들이 그들의 트랜젝션에만 해당되는 부분적인 히스토리 노드를 돈주고 사용하는 비즈니스 모델을 찾을 수 있기 때문에 이 문제가 중요하지 않다고 주장하기도 합니다. 다른 블록 익스플로러들이나 월렛 또한 라이트 히스토리를 사용할 수 있다고 생각했습니다. 하지만, 커뮤니티에서 대부분 갖고있던 인식은 체인 히스토리 데이터를 제공하는 것의 어려움이 EOS자체의 확장성에 대한 기대를 저버리는 것이며 이런 기대는 대부분 예견된 결과로 이어집니다. 이 글을 쓰는 시점(2019년 3월 7일)에 EOS 블록체인은 대략 4600만 블록을 갖고 있고, 서비스를 제공하기 위해 새로 진입하는 팀의 경우 지금까지 생성된 모든 블록을 소화하며 몇주가 걸리는 작업동안 초당 생성되는 2개의 블록들을 추가로 받아야 합니다. 싱크가 모두 된 다음에는, 버전1의 히스토리 플러그인은 5TB의 스토리지를 잡아먹습니다. 이 데이터베이스를 쿼리하는 것은 수많은 프로세싱 파워와 네트워크 밴드위스를 요구합니다. 결과적으로, 풀히스토리 노드를 운영하는 것은 매 달 15000달러 이상의 비용을 지불해야 합니다. 몇 달 전 EOS Rio팀은 가능한 솔루션들에 대해 브레인스토밍을 시작했습니다. 이미 인지된 문제점이었던 데이터 인제스천(ingestion), 스토리지, 그리고 쿼리에 집중하기 보다 우리는 문제의 가장 밑장부터 생각해보기로 했습니다. 첫 단계는 데이터베이스 사이즈를 최적화하기 위해 무엇이 필요한지 부터 분석하는 일이었습니다. 우리는 히스토리 API의 버전1이 반복되는 정보를 저장한다는 것을 알았습니다. 버전 1의 API와 함께 제공되었던 기존 eosio의 history_plugin은, 루트 액션 안에 있던 인라인 액션 트레이스를 저장했습니다. 이는 상당한 양의 데이터가 저장되어 한 유저가 한 어카운트에 대한 액션 히스토리를 요구할 때 마다 전송되는 결과를 낳았습니다. 또한, 인라인 액션은 주로 “event” 메커니즘으로 트랜젝션 별로 각 파티들에 노티하는(notify) 용도로 사용되었고, 저장할 가치가 없었습니다. 트랜젝션 벨리데이션 정보는 저장되지 않으며, 따라서 모든 정보는 Chain API를 통한 블록 정보를 통해 검증되며, dApp들은 히스토리를 해당 용도로 사용하지 않습니다. 이런 변화들로 인해 API 포맷은 짧은 반응 시간과, 적은 밴드위스 오버해드 그리고 UI/UX 개발자들을 위한 쉬운 사용성을 제공합니다. 포맷을 바꾸고 반복되는 데이터를 삭제하여 데이터베이스 사이즈를 85%로 줄일 수 있으며, 5TB에서 650GB로 줄일 수 있습니다. 계속해서 퍼포먼스를 향상시키기 위해 우리는 스테이트 히스토리 플러그인에서 데이터를 가져오는 멀티 쓰레드 인덱서를 만들었고, 지금의 솔루션이 몇 주가 걸렸다면 우리의 솔루션은 약 72시간이라는 시간 안에 적절한 하드웨어 최적화와 함께 EOS 블록체인의 데이터를 모두 인제스트 할 수 있었습니다. 또한 우리는 ABI 변환 중 히스토리 데이터의 병렬 프로세싱 시 역직렬화 오류(deserialization failures)를 방지할 수 있는 “ABI History Caching Layer”도 소개합니다. 데이터베이스를 위해, 우리는 브라질 리우데자네이루의 티어1 인프라와 같은 위치에 있는 두 커스텀 베어메탈 서버로 돌린 Elasticsearch 클러스터를 사용했습니다. 최적화된 데이터 스트럭쳐는 CPU와 밴드위스 사용을 줄이고 인프라 확장성을 확보할 것입니다. 풀 히스토리 노드를 돌리는 다른 BP들은 이미 Hyperion을 테스트하고 발전을 위해 돕고 있습니다. Hyperion HTTP API를 위해 자바스크립트 라이브러리를 만들고 이미 Hyperion 히스토리 (v2 API) 를 bloks.io 에 적용한 EOS Cafe의 Syed Jafri과 버전2의 cleos호환성을 위해 힘써준 Sw/eden 팀에게 감사의 인사를 전합니다. 또한 많은 도움을 준 eosDAC, CryptoLions 그리고 BlockMatrix 에게도 감사의 인사를 전합니다. 개발자들을 위해, 오늘의 히스토리 API 기준보다 축소된 결과를 제공하는 것이 더 낫다고 생각합니다. 지금의 eosio 히스토리 플러그인은 반복되는 정보 (엔드유저 히스토리를 위해)로 불필요하게 데이터베이스 사이즈를 키웁니다. 인라인 액션을 필터링하는 것은 API 밴드위스 사용과 코딩 복잡성을 줄여주었습니다. 이런 변화들을 수용하기 위해 EOS Rio와 함께 개발한 다른 BP들은 History API V2 standard를 지지하며, EOS 커뮤니티가 이를 채택하기를 바랍니다. 평가와 피드백을 우리와 공유해주시면 감사하겠습니다. EOS Rio는 Hyperion을 사용해 이미 History API를 제공하고 있습니다 (https://eos.hyperion.eosrio.io/v2/docs/index.html). 이 프로젝트의 코드와 셋업환경에 대한 인스트럭션은 https://github.com/eosrio/Hyperion-History-API 에서 확인할 수 있습니다. 우리는 이를 비영리 목적인 오픈소스 라이센스로 배포합니다. 또한 우리는 Hyperion 히스토리를 제공하려는 누구든 도움을 줄 수 있으며, 피드백을 기다립니다. 며, 이는 보다 디테일한 EOS 통계를 제공하기 위한 Hyperion 히스토리 API 위 추가 레이어입니다. We want to positively impact billions of people around the world through distributed ledger technologies.